I took a little trip to the beach with my family recently. One of the things we always do on the way is stop at the outlet stores. My favorite is the bookstore (as I write of it, in a different room, my husband shudders without knowing why). I love reading in general, and so do my kids, so the whole store is a playground for us. But - there is a huge cookbook section right when you walk in. It's just such a pleasure to peruse! Anyway, on this last trip, I purchased an unusual tome: The Marshmallow Fluff Cookbook. There are some pretty intriguing ideas in there. So, when I got home, I didn't know what I wanted to make, but picked up a jar of fluff at the grocery store. One day, when I was in a mallow mood, I started flipping through the book. 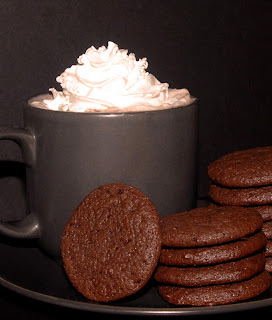 I happened upon a recipe that was actually created by King Arthur's Flour, called Midnight Mocha Madness cookies. Coffee. Chocolate. Marshmallow. Perfect! I did make a few changes to the recipe. First, the title. These cookies have all the flavors of hot cocoa (plus a hint of coffee). "Midnight Mocha Madness" just doesn't quite suit them, I think (they're more of a quiet and polite cookie). I changed the process a bit, too, mostly so that the recipe is easier and the final product more dependable. If you happen to purchase a brand other than Marshmallow Fluff, you might find yourself a half an ounce short of fluff. No matter! Just melt 1/3 cup of mini marshmallows into the chocolate mixture to make up for it. The original recipe also suggests that you might like to add in a cup of chopped pecans or walnuts. I'm sure that would be delicious, but it really isn't needed. The cookies are chewy and chocolatey with a hint of mocha. They've got all the comfort of a nice cup of cocoa. 1. In a medium bowl, whisk together the flour and baking powder. Set aside. 2. In a medium bowl, combine the butter, chocolate, cocoa powder, sugar, salt, and instant coffee. Microwave or heat in a double boiler, stirring often, until the butter and chocolate have melted and the mixture is smooth. 3. Pour the chocolate mixture into a large bowl. Stir or beat in the Marshmallow Fluff until well mixed. 4. Stir or beat in the egg until thoroughly combined. Stir or beat in the vanilla until thoroughly incorporated and smooth. 5. Stir in the dry ingredients until just blended. Do not overmix. 6. Cover and chill until firm (about 15 minutes in the freezer or 30 minutes in the refrigerator). 7. Meanwhile, preheat the oven to 400°. 8. Scoop tablespoon sized balls 2” apart on parchment-lined baking sheets. Bake for 6-10 minutes or until the cookies puff and set (are no longer shiny). 9. Allow the cookies to cool for 5 minutes on the baking sheets and then transfer the cookies to racks to cool. Enjoy! For something a little different, try omitting the coffee and replacing 1/4 - 1/2 tsp of the vanilla with peppermint extract. Yummy! Happy baking!